"American forces now hold about 22,000 Iraqi detainees at Camp Cropper in Baghdad and Camp Bucca, near the Kuwait-Iraq border. While the vast majority will never be charged under Iraqi law because there is not enough evidence to bring them to trial, the American military says that about a third remain security risks." "The emerging agreement, officials said, gives Iraqis [read puppets of the American occupation] much of what they want — most notably the guarantee that there would no longer be foreign troops visible on their land — and leaves room for them to discreetly ask for an extended American presence should security deteriorate." On the anniversary of the Lebanese Army, its acting commander issued a statement in which he expressed "hope" that Lebanon would liberate its lands that are occupied by Israel. I kid you not. 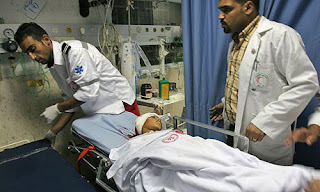 This is Zionism: "Israeli troops wounded three Palestinians in the occupied West Bank on Wednesday in a clash with protesters at the funeral of a 10-year-old boy killed a day earlier, Palestinian medics said." French journalist Thierry Meyssan has no credibility whatsoever. His conspiracy theories, like the one in which he claimed that no plane hit the Pentagon on Sep. 11, are outright kooky. I was thinking yesterday. Can you think of one smart Arab supporter of peace with Israel? No, really. I mean, the best they have is Egyptian playwright `Ali Salem. This says something, no? Saudi media, especially Al-Arabiya TV, are reporting the impending resignation of Olmert like one reports a death in the family. 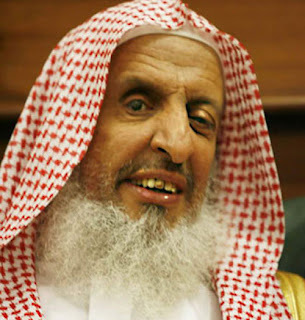 But then I again I realized why: he was prime minister when the Saudi-Israeli alliance was solidified and perfected. "Police have arrested 55 people at a party allegedly held by homosexuals at a farm near Qatif in eastern Saudi Arabia. David Dicang, the Philippine Embassy’s labor attaché in charge of the Eastern Province, said, “I know that some Filipinos have been arrested in that area and we are trying to help them.”" Saudi Arabic media are referring to the party as "deviance party". And notice that the arrests in those cases are always directed against poor foreigners. "The main reason we are losing in Afghanistan is not because there are too few American soldiers, but because there are not enough Afghans ready to fight and die for the kind of government we want." Ayatullah Muhammad Husayn Fadlallah commented on mini-Hariri's visit to Iraq. He said the purpose was "financial." Arab publisher, Riyad Najib Ar-Rayyis: blacklisted in the Arabic press. Sari Nuseibeh (who speaks for more Americans and Israelis than for Palestinians) is really worried that Israeli actions are leading toward a one-state-solution. He also is willing to give up the right-of-return in negotiations with Israel. Fortunately, for Palestine and Palestinians, Nuseibeh has not standing whatsoever among Palestinians, although he is in good standing at the Washington Institute for Near East Policy. "Canadian soldiers opened fire on a speeding vehicle after its driver ignored repeated warnings not to approach a military convoy Sunday, killing two young children." An airlift to deport demonstrating workers from Kuwait. "Palestinian sources reported on Tuesday afternoon that an 11-year-old Palestinian boy was shot and killed by IDF or Border Police troops." A new poll by the Beirut Center reveals that 74.8% of all Lebanese believe that "confronting the Zionist project requires a continuous resistance project." Only geniuses come to Lebanon: "Mika, a widely regarded pop music genius, enchanted a sellout crowd of 14,000 late Sunday in Martyr's [Hummus] Square, the heart of downtown Beirut." "President Bush and Iraqi Prime Minister Nouri al-Maliki are poised to conclude a bilateral "memorandum of understanding" that would authorize U.S. troops to continue military operations in Iraq. There is only one problem — the memo won't be binding U.S. law." The New York Times feigns care about the Palestinians. You see the New York Times is sensitive to Palestinian victims when their victimizers are not Israeli. 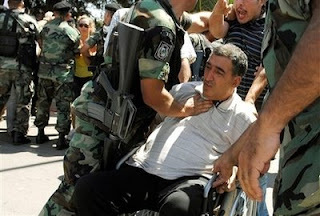 "Al Haq, a Palestinian rights group based in the West Bank city of Ramallah, released a report on Monday on what it called a “horrifying and blatantly illegal trend” of arbitrary arrests, torture and other cruel or degrading treatment against individuals in the West Bank and Gaza by “various Palestinian security or military agencies and personnel.” Al Haq said the maltreatment had resulted in three deaths in Gaza and one in the West Bank since June 2007. Human Rights Watch is to release a report on Wednesday documenting abuses by Hamas against Fatah in Gaza, and by Fatah against Hamas in the West Bank, in the past year." 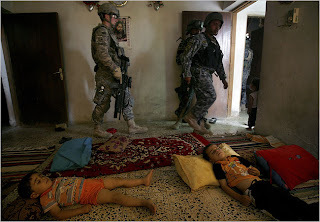 "As best I can piece it together, what actually seems to have happened was that the escalation troops began by disarming the Sunni Arabs in Baghdad. Once these Sunnis were left helpless, the Shiite militias came in at night and ethnically cleansed them. Shaab district near Adhamiya had been a mixed neighborhood. It ended up with almost no Sunnis. Baghdad in the course of 2007 went from 65 percent Shiite to at least 75 percent Shiite and maybe more. My thesis would be that the United States inadvertently allowed the chasing of hundreds of thousands of Sunni Arabs out of Baghdad (and many of them had to go all the way to Syria for refuge). Rates of violence declined once the ethnic cleansing was far advanced, just because there were fewer mixed neighborhoods." "But that demand was foreshadowed by an episode in June 2006 in which al-Maliki circulated a draft policy calling for negotiation of just such a withdrawal timetable and the George W. Bush administration had to intervene to force the prime minister to drop it." "A gang of settlers from Yitzhar settlement, to the south of Nablus in the West Bank, set fire to a Palestinian house in the village of Burin in the early hours of Monday morning." 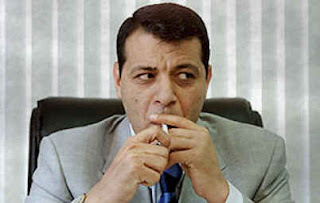 The fruits of the Bush Doctrine: Dahlan rules. "One of several former detainees interviewed in Nablus and Jenin, he described what appeared to be a pattern in which Hamas sympathisers are often only released on production by their families of money or guns. The alleged abuse by PA forces appears to be aimed at convincing western donor governments, as well as Israel, that the authority is "clamping down on terror"." "One can occasionally see glimpses of this reality. For example, the estimable "Angry Arab," the learned professor As'ad AbuKhalil, points us to a key passage..."
Hizbullah is effective in fighting Israel and ineffective in fighting its domestic rivals. Hamas is ineffective in fighting Israel but effective in fighting its domestic rivals. ""When I see a crowd of well-dressed men and women and chubby children, it bespeaks prosperity, and I know you are prosperous and happy."" (This about one of the poorest section of California). "The unemployment rate in the Gaza Strip now stands at 45 percent, higher than anywhere else in the world, according to a report released recently by the United Nations Relief and Rehabilitation Administration." How much groveling (toward Israel) can advocates and propagandists for the Syrian regime do in one week? The answer is: plenty. And please: tell the Syrian regime not to speak on behalf of all Arabs when they promise peace and normalization with Israel. And remember that Sadat had promised them the same. "Olmert: Living with 270,000 Arabs in Jerusalem means more terror"
"Completed in Paris six months before his death, Walter Benjamin’s final report to Max Horkheimer on the literary situation in France is published here for the first time in English." It is without exaggeration that I say that you can't trust the New York Times on the Middle East, even if it is about non-political aspects of the region. Look at this obituary of Egyptian filmmaker, Yusuf Chahine. The longish piece does not do justice to the man, and even distorts his personality and political positions. I met Chahine once in Washington, DC and spent hours with him. He would rail for house about US imperialism and Zionism. This art critic for the Times (who has the political sensitivity of Meir Kahane) transformed Chahine into some lame Egyptian liberal, a la Mahfouz, to whom he audaciously compared him. Chahine was a socialist enthusiast, and categorically opposed any normalization with Israel. He even developed nostalgia for Nasser after the rise of the Sadat dictatorship. Compare this obituary in the Guardian (which took a break from its obsessive coverage of the plight of white farmers in southern Africa): "When I met him in Cairo in 2002 he had just hit the headlines of the newspapers after the police had used tear gas to disperse a peaceful demonstration against Israel: Chahine, suffering from heart problems, was carried from the scene by students." I have this question for the New York Times and like-minded Zionist fanatics: do they think that by ignoring the reality of popular and intellectual hostility to Israel and Zionism that they can wish it to go away just like that? Fat chance. "The U.S. military admitted Sunday that American soldiers killed civilians after opening fire on a car last month on the heavily secured Baghdad airport road. The statement — which called the man and two women killed "law abiding citizens of Iraq" — reversed earlier military claims that they were suspected militants who shot at a parked American convoy." Walid Jumblat's interview on New TV today was quite a show. He basically moved from channeling Elliott Abrams to channeling...George Habash. For some reason, I kept thinking of the various Zionist fanatics/neo-conservative Americans who have been saluting and singing the praise of one of the most unprincipled politicians in the Middle East. George Will once said that George H.W. Bush was one of the most unprincipled people in U.S. politics, and Jumblat is the one in Lebanon. How will they now adjust to the re-adjustments of their friend Walid Jumblat? What will Dennis Ross say now? All those people who showered praise on him in his last WINEP appearance, how will they react now? I never have seen somebody utter the word Palestine more than Jumblat this evening. I kid you not. It was even comical. Hell, he talked about Palestine more than...Angry Arab. It was like: Hi...Palestine. Good...Palestine...Evening.I..Palestine...am...Palestine..glad...Palestine...to...Palestine...be...Palestine..with...Palestine....He said that his father, and even Rafiq Hariri died for..Palestine--he did not explain the last one. He said that March 14th got too sequestered in an isolationist position and that they have ignored the "constant principles" of his struggle: Palestine and Arabism and resistance. He went on about the importance of Palestine and Arabism. He substantially softened his rhetoric against Syria, so much so that I am certain that MEMRI will not send a special bulletin of this particular interview. He was nice about his friend "Condy" and he clearly implied that his "friend", former U.S. ambassador in Lebanon, Geoffrey Feltman, privately expressed to him views critical of the Bush administration stance toward Palestine. He did not forget to send salutations to "the Arab knight"--his ritualistic reference to the Saudi King. He said that the Bush administration was way too late in addressing Palestine, and at one point blamed the Lebanese crisis (over the issue of airport security and Hizbullah's communication network) in May to a press leak by..."Imperialism and Zionism." I am not making this up. He used those words. He spoke about the need to re-educate his own party on Palestine and Arabism. He criticized his allies in March 14th, and accused them of racism against Palestinians and Syrians. He said that he only visited the U.S. to ask for the overthrow of the Syrian regime at first, but later only to ask for their help regarding the international hariri tribunal. He said that he is disillusioned with the U.S. administration and its policies and mocked the dispatch of the Cole destroyer to the waters off Lebanon. It was quite a show of political opportunism. He defended his embrace of Samir Al-Quntar, and said that some of his March 14 allies have blamed him for his recent rhetoric about resistance, and his implicit blame of the Hariri camp for the clashes in Tripoli. He now wants "normal relations" with the Syrian regime. He also mocked Now Lebanon website, and clearly implied that they represent pro-U.S. Shi`ites. He also speak about oppression in the Arab world as if all Arab countries are free and democratic except Syria. He admitted that his party is a sectarian Druze party, but named four non-Druzes in his party as if that proves anything. Equally repulsive, will be the Hizbullah's coming political flirtation with him in response. "Under the far harsher regime of Afghanistan, death for apostasy is still on the statute book, despite the country’s American-backed “liberation” from the tyranny of the Taliban. The Western world realised this when Abdul Rahman, an Afghan who had lived in Germany, was sentenced to die after police found him with a Bible. After pressure from Western governments, he was allowed to go to Italy. What especially startled Westerners was the fact that Afghanistan’s parliament, a product of the democracy for which NATO soldiers are dying, tried to bar Mr Rahman’s exit, and that street protests called for his execution." "During Mr. McCain’s last two tours of the Middle East — conducted without the invasive scrutiny of network anchors — the only news he generated was his confusion of Sunni with Shia and his embarrassing stroll through a “safe” Baghdad market with helicopter cover. He should thank his stars that few TV viewers saw that he was even less at home when walking through a chaotic Pennsylvania supermarket last week. He inveighed against the price of milk while reading from a note card and felt the pain of a shopper planted by the local Republican Party." "In the July 21 Bee ("Lebanese line up to praise freed killer and symbol of resistance," Page A-6), your reporter most of the time referred to the freed Lebanese prisoner, Samir Kantar, as a "killer," thus accepting the Israeli point of view that he killed an Israeli child, rather than Kantar's claim that the child died during a shootout with Israeli commandos. Now, if your reporter was a commentator, I would not have had any problem with that, though I would still have opposed this point of view. But your reporter is supposed to be neutral and not take sides. A reporter's duty is to try to be objective. Thus, your reporter could have said "the alleged killer," or a similar phrase which would convey the fact that there are two versions of the events. I denounce this lack of objectivity. Without doubt, in the Israeli-Arab conflict, both sides have committed atrocities, and the Western media have mostly accepted the Israeli version of events as "truth," not expressing any sympathy toward the victims of Israeli aggression against Arab civilians. I remember clearly the picture of a car smashed under an invading Israeli tank, with a Lebanese family of five within it. This is not to justify acts of brutality against Israeli civilians. It is only after we accept the humanity of both sides and denounce violence committed by both sides that we can expect peace to take hold. ""Amnesty International believes all 16 to be prisoners of conscience, detained for their participation" in a "peaceful protest in the city of Alexandria on 23 July," the London-based rights group said in a statement. "Amnesty International on Saturday urged the authorities in Egypt to free 16 Internet activists jailed for more than two weeks for "threatening national security." "The Federal Aviation Administration could soon cut back the number of flights from Israel to the United States after finding Israel's aviation safety to have "severe security shortcomings," according to a report by Israeli newspaper Haaretz." "Tali Fahima, a Jewish Israeli woman who was tried and convicted for her contacts with Zakariya Zubeidi, former Jenin chief of the Al-Aqsa Martyrs' Brigades, criticized Zubeidi on Thursday, saying that he had turned into the "whore of the Shin Bet security service."" "QUESTION: There’s a report in the Middle East that General James Jones presented a report to Secretary Rice about the security situation between Israel and the Palestinian Authority in the West Bank, and it was very critical to Israel. Do you have anything about this? MR. GALLEGOS: Yeah. My understanding is that he is yet to publish a report. There are stories about drafts that have been released. The bottom line is the general has been there. He’s taken a look at the situation. He has the full support of the Secretary. We’re going to continue working through him and with him and we’ll see – ultimately see what is published. QUESTION: Does the President have a decision made on whether the full report will be published and public? MR. GALLEGOS: I don’t have any information on that (inaudible). QUESTION: Is that under discussion at the moment? MR. GALLEGOS: I’ll have to check. I don’t have anything on that. QUESTION: Does the State Department have a position on whether it should be? "Some Muslim preachers in the West Bank and Saudi Arabia have taken notice, saying the show is un-Islamic and urging the faithful to change channels. But all the same, the show may be planting seeds of change." Saudi police arrested 9 "Arab and foreign women" in "disturbing situations." "Are you still practicing Sufism? I think the word is “studying” it, “learning” it. Isn’t it a strand of Islam, founded by Muhammad? I know people think this, because they have looked in the nearest reference book, but the thing is Sufism has always had adherents from all faiths or none. As a longtime resident of London, what do you make of the growing Islamic presence in Europe? I don’t go on and on about it, like our two knights. You mean Martin Amis? And who else? The other one who never stops going on about Islam. Christopher Hitchens. I don’t want to add any nasty poison to this brew. It’s nasty enough as it is, so let’s leave it." I just have one question about the questions by Deborah Solomon. What would happen to an American reporter's career if she/he were to ask a person about "the growing Jewish presence in country X"? Who is behind it, one wonders? "A wave of bombings against Hamas targets in the Gaza Strip has stoked intra-Palestinian tensions." "“I have had a very adventurous life, but not because I have an adventurous nature or yearned for a life full of adventure,” he said. “Fate just wanted it this way.” Yet while the West has lionized him, in his native Czech Republic, 19 years after the fall of the Berlin Wall, he remains a source of ambivalence, if not sometimes downright resentment. “Havel gets attention in the West by saying banal, kitschy things,” said Bohumil Dolezal, a leading right-wing commentator, who once worked for Mr. Klaus." Jeffrey Fleishman of the Los Angeles Times offers this verdict on Mubarak's dictatorship: "Even though Egypt is a democracy..." No, really I am curious now. How does this work? Countries that sign peace treaties with Israel are automatically elevated to the status of democracies? "The report, based on data from the Palestinian Central Bureau of Statistics, reinforces anecdotal evidence given by such people as one prominent Gaza construction employer who recently estimated that of more than 100 workers he was obliged to lay off because of a lack of materials, a majority had joined the Hamas police force or its military wing. Some diplomats have privately questioned the wisdom of a blockade which makes it easier for Hamas to recruit force members. The UN says that the burgeoning youth segment of the Palestinian labour force (15- to 24-year-olds) was "the ... most prone to increased unemployment"." "British soldiers in Afghanistan today killed four civilians and injured three more after opening fire on a vehicle that failed to stop at a checkpoint, Nato and defence ministry officials said." 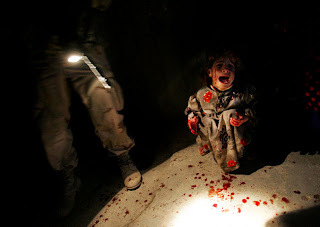 "JAN. 18, 2005 An Iraqi girl after her parents were killed by American gunfire in Tal Afar." "Zoriah Miller, the photographer who took images of marines killed in a June 26 suicide attack and posted them on his Web site, was subsequently forbidden to work in Marine Corps-controlled areas of the country. Maj. Gen. John Kelly, the Marine commander in Iraq, is now seeking to have Mr. Miller barred from all United States military facilities throughout the world. Mr. Miller has since left Iraq." "They beat me for a long time. It felt like a whole day went by. I felt frightened, angry, and humiliated, and I was in pain." "Several of Obama's Middle East advisers - including former Clinton special envoy Dennis Ross and ex-ambassador to Israel Daniel Kurtzer - were hovering in the vicinity." "An Israeli journalist told PNN that the Yediot Achronot newspaper took 100 percent of its information from Arab news agencies. Specifically, the Israeli press took information from Al Quds Al Arabi, Asharq Al Awsat and Dar al Hayat, which are all Arab newspapers. Assafir and Al Akhbar, two Lebanese newspapers, were also used as primary sources of information." "At that meeting, with IDF officers and officials from the State Prosecutor's Office, Baram focused in particular on two yeshivas in the northern West Bank whose students have been party to crimes against Palestinians in the area. One, called Dorshei Yihudcha, is located in Yitzhar and headed by Rabbi Yitzhak Shapira, an associate of Rabbi Yitzhak Ginzburg, who headed the Od Yosef Chai yeshiva that was formerly located at Joseph's Tomb in Nablus. Shapira is among the rabbis who signed a manifesto in support of the suspects in a brutal attack on two Arab youths on Holocaust Remembrance Day in May. "The community's moderates are unable to exert their authority over the yeshiva boys, and there are many complaints in the area," Baram was quoted as saying. "Two yeshiva boys recently went into a nearby Palestinian village to set fire to Palestinian cars, but they were caught and beaten, and the army had to extricate them."" "While most Israelis have been galled at the extent of the alleged corruption, no one has been surprised by the source of the funds. Politicians in Israel have long known that if they want to raise large amounts of money, for whatever reason, they'll find it in the United States. Foreign donations are banned for general elections, but Israeli leaders routinely get half or more of their campaign contributions for party primaries from overseas, and mostly from American donors. The fundraising trend is especially pronounced on Israel's political right; politicians who advocate aggressive military action against Iran and Hamas and who maintain an uncompromising stance against ceding land to the Palestinians have typically found generous support for their views in the States. Former prime minister and Likud Party leader Binyamin Netanyahu, for instance, received approximately $400,000 -- 75 percent of his donations for a 2007 primary -- from U.S. contributors, according to the Israeli comptroller's office. By contrast, Israeli donors accounted for less than 5 percent of reported contributions to Netanyahu, who hopes to return to power if Olmert falls and who has sharply criticized the current government for its willingness to cut deals with Israel's enemies." My article in Al-Akhbar: "Those who returned to the homeland." "It’s great to see Mr. Moufarrege’s witty embroidered paintings here, turning art history into pop culture. His “Truth About John the Baptist,” with its hulking superhero, Arabic script (it reads, “My father taught me Arabic calligraphy”) and child floating in a pool of pink glitter, looks just right today. So does Mr. Wong’s “Sweet Oblivion” (1983). It’s the most beautiful painting of the Lower East Side I know of, and it’s an image of a time and place that now exist only in art and memories." "A Saudi football star playing for a Swiss team has refused to play against an Israeli team for apparent political and religious reasons." "Police have arrested 26 Internet activists in the port of Alexandria, and 14 of them were jailed for more than two weeks for "threatening national security," a security official said on Thursday. Around 30 young Egyptians who belong to the so-called "6 April" group on social networking site Facebook, a group which earlier this year called for a day of protests at rising prices, gathered in Alexandria on Wednesday." Al-Quds Al-`Arabis is reporting that Obama was scheduled to have lunch with Israeli occupation puppets, Abu Mazen and Salam Fayyad, but that Obama changed his mind and decided to have lunch with his Israeli friends instead although the dishes were prepared. It was a boo hoo hoo moment for Abu Mazen and Salam Fayyad. For those who asked for a definition, this is Zionism: "On Wednesday 23 July, three Israeli settlers, one masked and wielding a stick, pursued 14 Palestinian children who were on their way to a summer camp in At-Tuwani." "I wonder why Iraqi cuisine is not more sophisticated," he said. "It is essentially peasant food, which I happen to love because it fits my palate perfectly. But intellectually, you wonder why, with all of its influences, the food isn't more complex." I find your article "A Bit of Old Baghdad With a Western Twist, Dining, April 23" to be somewhat offensive, ill informed and badly researched. I am an Iraqi who grew up to the delights of the Iraqi cuisine and unlike Mr. Gosh—who had spent time in Baghdad perhaps eating in restaurants around the green zone—I had a very different experience. I completely disagree with the portrayal of Iraqi food in this article as "peasant food" and not "complex." I find such statement reminiscent of the simplistic media representation and understanding of Iraq and Iraqi society. Iraqi dishes vary from one region to the other and many are 'complex' dishes that require skill and years of experience. I recommend that both Mr. Gosh and the author read Nawal Nasrallah's cookbook, Delights from the Garden of Eden, which explores both the history and the various recipes of the Iraqi cuisine. As an Iraqi, I find it disconcerting that even our food now has to be reduced and simplified by western media reporters. I am an Iraqi who grew up to the delights of Iraqi cuisine. I disagree with the portrayal of Iraqi food in the article as "peasant food" and not "complex." Iraqi dishes vary from one region to the other and many require skill and years of experience. I recommend Nawal Nasrallah's cookbook, Delights From the Garden of Eden, which explores both the history and the various recipes of Iraqi cuisine. This is a very disturbing form of censorship and silencing of critical Iraqi voices who seemed to have lost even the ability to speak for their own food and cuisine. As simplistic representation of Iraqi society continues to predominate Western media, Iraqi cuisine seems to become now its latest victim." "Eight Iraqi trade union leaders have been forcibly transferred from Basra to Baghdad, where their lives are said to be at risk for opposing a planned law in which control over oil exploration and production would be placed in foreign hands." It is an indication of the sad state of Arab (official) affairs that there is a Libyan-Swiss crisis because the Swiss police did what is right, in briefly arresting the spoiled brat of the Libyan dictator. In fact, I fault the Swiss authorities for releasing that abusive brat on bail. They should have kept him in custody, and even called for the extradition of his murdering father. "About 100 people worried about industrial pollution set fire to a construction site of a local unit of Dow Chemical Co in western India on Friday, police and a Dow official said." "It is the seventh video she will have posted since she made her online debut in March. Speaking in English, she asks people to suggest stereotypes they have heard about the Arab world so she could "break them down one by one"." Wow. How impressive. And who is better than you to break down stereotypes. Here is one for you: there is a stereotype out there that your pathetic King spends all his time playing PlayStation III, and there is another one that you really believe that you are some queen and that you are the most boring public figure that Jordan had to deal with. Oh, and you really are proud of yourself that you can speak English. Break those down for me, one by one. "He still refuses to talk about various meetings and discussions he held in the corridors of global diplomacy. He agrees to speak about the relationships he developed with his colleagues from Oman, Morocco and Qatar." It was cute that Bush invited dissidents from Syria, Iran, and Sudan. The Syrian dude he invited is a big fan of Bush, only more right-wing than him. Bush did not invite dissidents from Libya, Tunisia, Morocco, Egypt, Yemen, Saudi Arabia, Jordan, Kuwait, Bahrain, Qatar, and Oman because he said all those countries have succeeded under his stewardship to achieve full blossoming democracies. Hail the Bush Doctrine NOW. Yesterday, the Saudi Al-Arabiya TV (owned by King Fahd's brother-in-law) aired a report about the decline of press freedoms in Mauritania. I kid you not. Mauritania: the most democratic Arab country. It is hilarious that Dahlan media are criticizing Obama's stand on Israel but only in the service of...Bush. "Still, the legal process ahead is likely to be messy, because the Supreme Court has left much unsaid. It did not pronounce on the legality of the military commissions, the standard of proof required to be held in detention, the admissibility of evidence obtained under duress, and what access prisoners will have to secret information. Moreover, the ruling does not cover the roughly 21,000 prisoners held by American forces in Iraq or the 650-odd in Bagram in Afghanistan, which get far less scrutiny. Donald Rumsfeld, the former American defence secretary, famously said that Guantánamo Bay was meant to house the “worst of the worst”. Yet the majority of the 780 or so prisoners who have passed through the hands of the interrogators there have been sent back to their home countries without charge. Of the remaining 270, only 20 have had charges for war crimes filed against them. Between 60 and 80 may eventually be prosecuted. About 60 have been approved for release but for various reasons cannot go. That leaves an awkward group of perhaps 120 against whom there is insufficient evidence to prosecute but who are still considered dangerous. Some legal experts argue that a new national security court should decide whether they can be interned without trial." Hizbullah held a solidarity event in Beirut in tribute to...the Sudanese dictator. It is one thing to denounce the hypocrisy and dishonesty of the ICC, but it is another thing to show support for Al-Bashir. The Hizbullah speaker (the influential Political Assistant of Hasan Nasrallah) offered some really pathetic praise for Al-Bashir. People don't realize that the American effort at public diplomacy has really been winning hearts and minds in the Muslim world. ""The walls between the countries with the most and those with the least cannot stand. The walls between races and tribes, natives and immigrants, Christian and Muslim and Jew cannot stand," he said." He added the Israeli separation barrier is different because it is...cute. "Saeb Erekat, a senior aide to Mr. Abbas and a senior Palestinian negotiator, said in an interview after the meeting that Mr. Obama seemed to be committed to helping both sides achieve a peace accord and was supportive of pursuing a two-state solution." Erekat said that about Bush, and will say that about Meir Kahane provided you can gaurantee to get his name and picture in a newspaper in the West. The Palestinian people and its cause deserve so much better. So much better. "B’Tselem, the Israeli human rights organization, reports that a total of 123 Israeli minors have been killed by Palestinians since the second intifada began in 2000, compared with 951 Palestinian minors killed by Israeli security forces." The Syrian delegation in Washington, DC deserves all the humiliation that it is receiving. After begging for an audience with AIPAC, the lousy delegation prostrated itself before the Saban Center in the capital. Their meeting with a U.S. official was canceled. I relish every humiliation that any Arab government can get. They deserve that--and more. There has been a disconnect between the abilities and talents of the Palestinian people and the organizations that speak in its name. (Having said that: the reality remains: the suffering of the Palestinians have been caused first and foremost by Zionism). But I have been distressed and disgusted to what happened to the returning bodies of Palestinians and Lebanese as part of the recent prisoners' exchange. Sources tell me that the Democratic Front for the Liberation of Palestine scrambled to take credit for a large number of the bodies, even when there was no evidence to its claim (in some cases the remains are only teeth). Members of the DFLP rushed to write "Hawatimah" on the boxes, and it is being bizarrely claimed that none of the boxes belong to fighters from Fath, which in the 1960s, 1970s, and 1980s provided most of the fighters--before the rise of Dahlan. So the DFLP managed to dishonestly claim that most of the boxes belong to its members when the organization did not have much of a record fighting Israel, and the one operation it managed to pull (Ma`alot) was quite lousy (although typically in those cases, the murder of the people is caused by savage and indiscriminate Israeli gunfire and bombings). And the pro-Syrian Ba`th party is also claiming some of the bodies when this organization was known for thuggery but not much more. Even the Hariri gang is taking credit for one of the bodies. Don't ask me how. Samir Quntar was on Future TV. MEMRI typically took one sentence from a long interview to market. He again denied the Israeli version of events of what happened back in 1979, when he was 16 years old. He revealed the Maariv the day after his arrest in 1979, reported that the victims in that attack were killed by Israeli gunfire. He said that he was subjected to torture in order for him to agree to the Israeli version of events, but said that the judge did not include the charge about killing the girl in his sentencing. He said that an Israeli medical doctor participated in the cruel and savage torture to which he was subjected. He also spoke about the history of Palestinian prisoners' protests in the apartheid state of Zionism. More than 100 prisoners have been shot and killed in those protests. In 1970, Israeli occupation prison guards shot and killed a Palestinian prisoner during a major protest when the prisoners protested the Israeli policy whereby all prisoners were required to address their jailers as "O, Master." In other news, the killer of women, children, and elderly and the killer of Palestinian poet, Kamal Nasir, remains at large. 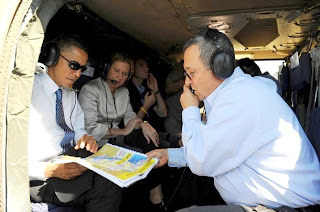 And he (Ehud Barak), yesterday gave a tour of the occupied territories to Obama. "“Let me be absolutely clear,” he said. “Israel is a strong friend of Israel’s.”"
There is no qualitative difference between the countries of the Saudi camp and the Syrian and Iranian regime in that they all agree that their priority is to stay in power, and all are willing to sell the Palestinians and their own slogans to stay in power and to please the American administration. I mean, what about that request by a semi-official Syrian delegation visiting Washington, DC to meet with officials from AIPAC? And this article here quotes a source in the DFLP that the Syrians whose bodies or remains were returned by Israel to Lebanon in the recent prisoners' exchange were in fact wanted by the the Syrian regime because they were working (fighting) with Palestinian organizations? King PlayStation: "Obama finally found a Muslim with whom he’s willing to be photographed." The press coverage of the White Man of the developments in Zimbabwe has been quite sickening but not surprising at all. We are treated to articles that want us to believe that Mugabe is the worst dictator out there. Yet, here he is meeting with opposition leaders and signing deals with them. Can you imagine the pro-U.S. dictators in UAE, Jordan, Kuwait, Saudi Arabia, Tunisia, Libya, Morocco, Egypt, Oman, Qatar, Bahrain, and other places meeting with opposition figures? I mean the president-for-life-and-death in Egypt put an opposition figure in jail for daring to run against him in a sham presidential election. While the I.C.C. basically killed itself before it started by destroying its credibility in its total subservience to the U.S.--the country which did most to basically undermine the work of the International Criminal Court, and while the ICC can't be taken seriously as long as it will never be able to take on the country which has been committing the most war crimes since the end of the Cold War, the Sudanese dictator is one of the most repugnant religious demagogues out there. Whenever he faces a crowd, he resorts to religious chants that have no relevance whatever. I watched him on TV today leading a crowd with chants of God is Great. "A Palestinian girl and her brother died on Tuesday after they drowned in an open sewage reservoir in the Shuja'iyya neighborhood of Gaza City." "Robertson advocated that Israel look out for the “survival of its nation” and “make some kind of a strike” against Iranian nuclear facilities." Pearl of Angry Wisdom of the day: Political Opportunism kills talents. Watch out. I have lately been saying, based on my observation of a certain former leftist in Lebanon who now writes for the Hariri rag, Al-Mustaqbal, that political opportunism provides its own form of self-punishment. Political opportunism kills any talents or creativity that a person may have. For those of you who are considering careers of political opportunism remember that. Fouad Ajami was not that talented intellectually speaking, but he at least used to write nice prose--25 years ago, and most of it cliche-ridden and very repetitious and tedious at times. But look at him now: does he not sound like Israeli propagandists? He can't come up with one original thought or even expression anymore. This says all. U.S. foreign policy in the Middle East (no matter whether there is a Republican or a Democrat in the White House) hinges on crooks, tyrants, thugs, and criminals. Here, Obama crowns his visit to Iraq by meeting with chief tribal thug, Ahmad Abu Risha (whose family went from support of Saddam, to support of Bin Laden, to support of U.S. occupation). "Palestinian officials said they didn't bring up the Jerusalem remarks in their meeting with Obama on Wednesday." Of course they did not. They can only bring up what their Israeli and U.S. master tell them to bring up. Prince Sultan visits his brother Prince Fawwaz. The latter died, leaving behind a legacy of misogyny, oppression, and sleaze. That leaves the number of Bay`ah council down to 34. "“What we know is American presidents all support Israel,” said Muhammad Ibrahim, 23, a university student who works part time selling watermelons on the street in the southern part of this city. “It is hopeless. This one is like the other one. They are all the same. Nothing will change. Don’t expect change.”"
I usually don't agree with literary critic, `Abduh Wazin. But here he makes an interesting point about the Orientalist trends in the writings of Arab writers in English and French. He calls it "exoticism", intended to attract Western readers. Don't leave me behind. What about us the puppets of occupation? Al-Arabiya TV began its morning broadcast by airing lenghty comments--pleading, really--by Ahmad Abu Risha (successor to `Abdus-Sattar Abu Risha. He said that Obama should not mention any reference to withdrawal or timetables. Abu Risha almost said that his men would continue to fight for the American occupation provided they continue to receive $300 per month, although his men threatened to go back to supporting Al-Qa`idah a few months ago when their stipends were late in arriving. This is a war of principles and lofty ideals. Make no mistake about it. Comrade Ra'id discuss the discourse Lebanese liberals. "The rapid rise in tuberculosis cases in Eastern Europe and the former Soviet Union is strongly associated with the receipt of loans from the International Monetary Fund, a new study has found. Critics of the fund have suggested that its financial requirements lead governments to reduce spending on health care to qualify for loans. This, the authors say, helps explain the connection." You can't accuse the National of Organization of Women in the U.S. (which is dominated by upper class white women) of insensitivity to religious and ethnic minorities. I mean, this year NOW decided to invite somebody representing Muslim women. They decided to invite Irshad Manji. I am not kidding. Comrade Pierre writes about King `Abdullah conference on religious intolerance (which condemned "illicit sexual relations"). "Senior officials in the U.S. State Department, including Secretary of State Condoleezza Rice, have repeatedly complained to Israel recently over relatively minor Palestinian issues that it would have ignored until a few months ago, Israeli officials say." Hanan Ashrawi: a friend of Rice. How nice. How touching. Is this like the friendship between Dahlan and Mofaz? The new AlJazeera. How much AlJazeera has changed under U.S. pressure and in the wake of Saudi-Qatari reconciliation. Yesterday, I watched some part of a show on Iraq: one Arab critical of the American occupation (Raed Jarrar) was invited but his view was presented as the token Arab point of view. The rest of the guests were American officials or former American officials, the former puppet ambassador of the Iraq-under-occupation, and an "expert" from the Hudson Institute. Victims with names. As-Safir published the names of the 167 dead bodies of the 197 dead bodies returned by Israeli occupiers in the prisoners' exchange. You will notice people from different Arab countries who died fighting for Palestine. I like it when I see puppets of occupation displaying their conflict: "A senior Palestinian official said British Prime Minister Gordon Brown can keep the 60-million euros he promised to the Palestinian Authority when he appeared in Bethlehem Sunday. Yesterday, Sari Nusseibeh, the Palestinian Authority's representative in Jerusalem, held a packed press conference for the international media, where he said further foreign aid should be curtailed until Israel's presence in the disputed territories end. Mr. Nusseibeh said life becomes "too complacent for the Palestinians" when they accept foreign aid. The removal of foreign aid would place the burden of supporting the Palestinian entity entirely on Israel's shoulders in his opinion. He acknowledged that one of the reasons for his support of the cessation of further foreign aid to the Palestinians involved the allegations of wanton corruption, leveled against Yassir Arafat and his successor Mahmoud Abbas. While advocating an independent Palestinian state, Mr. Nusseibeh also worried about violence in Palestinian society. In answer to a question, he admitted that much of the incitement occurs during the evening telecasts of the Palestinian Broadcasting Corporation, which operates under Mr. Abbas' supervision." Notice that this report referred to Nusseibeh as "senior official" while he is neither. But maybe they meant that he was a senior puppet of occupation. According to a report by an Iraqi puppet ministry, 313 mosques and 41 churches have been attacked since the "liberating" American troops arrived into the country. Wave your flags, NOW. Mini-Hariri in Baghdad. Amer Mohsen wrote this for Iraq Slogger: "In recent days, a visit by Lebanese leader and businessman Sa’d al-hariri to Iraq has fueled speculation and analysis in the Arab Press, with several reports published to investigate the significance of the trip, in which Hariri - a “Sunni” leader, pro-Saudi and pro-American - met with the entire top tier of Iraqi leadership, in addition to Ayatollah Sistani - who, at some point, was depicted in the Western Press as a hermit-like character, aloof from daily politics and reticent to meet with politicians (nowadays, the high Shi’a cleric is often paid several weekly “visits” by Iraqi and foreign officials.) In the Lebanese al-Mustaqbal daily, founded and owned by the Hariri family, Wissam Sa’adeh wrote on the alleged benefits of the Hariri visit, contemplating a meeting of minds between Shi’a and Sunni Arabs who support the “project of the state” (ostensibly, individuals like Hariri and Maliki, allied with governments like Saudi Arabia and Jordan) against those Shi’as and Sunnis furthering a project of “sedition” in the Middle East (with references made by the author towards Iran and Syria, the common target of the Hariri-owned media in Lebanon.) In the op-ed, the author argued that recent bouts of civil strife in the Middle East (specifically in Iraq and Lebanon) were employed and furthered by radical forces using sectarianism to hamper the “project of the state.” On the other hand, he claimed, Iraq and Lebanon are witnessing a bright model of state-building that eschews radicalism and sectarian violence. The author added that the representatives of this project (such as PM Maliki and PM Siniora) are also making advances, citing the recent “successes” of the Iraqi government forces “from Mosul to Basra, passing by Anbar.” Sa’adeh ends his article by expressing dismay at those who “deny the qualitative security improvement (in Iraq) or dismiss its importance,” equating such a stance on behalf of “the anti-globalization and anti-imperialists” with “wishing for … the death of the largest number of Iraqis.” The same visit was read quite differently by Lebanese daily al-Akhbar, a left-leaning secular publication that generally opposes US policies in the region. The paper’s Iraq correspondent, Zaid al-Zubaidi, said that Hariri’s visit was mainly for business purposes, with his “informal” high-level meetings devoted to delivering a political message from Saudi Arabia. On the political aspect: Sa`d Hariri – who holds Saudi citizenship - is occasionally sent on “missions” by high-level Saudi officials. According to many observers, including al-Akhbar, the visit may have included a Saudi message of “rapprochement” with the Maliki government. On the business aspect, the paper cited skeptics who claimed that Saudi-Iraqi relations are decided on a “higher level” and that Hariri’s visit merely represented the commercial side of Saudi-Iraqi detente. These analysts point out that Hariri met with figures close to the Oil Ministry, that his visit to ‘Ammar al-Hakeem was labeled by Iraqi media as a “business meeting,” and that Talabani’s statements after meeting with Hariri focused on Iraq’s need to emulate the “success” of the “Hariri companies” in Lebanon’s post-war reconstruction. Furthermore, the paper revealed, a company owned by Hariri is currently bidding for a major Baghdad development (in terms of scale: the project – called al-Rasheed - is situated over 150 million Sq feet of land in the capital and – when completed – will include residential units for 400,000 people.) Lebanese commercial involvement in Iraq is not a small matter, a report in the Economy section of al-Akhbar said. Billions of dollars are currently invested by Lebanese businessmen (often managing, partnered with, or acting as fronts for Gulf capitals) in the high-risk environment of Iraq. And in the Middle East, where commerce often mixes with politics, the names of many members of the Lebanese and Iraqi elite are found in these investments. For example, on the same day of Hariri’s visit, it was announced in Arbil that a Lebanese-financed $60 M hotel project will be constructed in Kurdistan’s capital. A ceremony was held for the announcement, attended by Kurdistan’s Prime Minister and the Lebanese ex-Minister of tourism, a political ally of Sa`d Hariri. During the ceremony, Kurdish officials announced that Lebanon is the second-largest investor in Kurdistan, with projects in the pipeline amounting to Billions of Dollars (including a $2.9 Bn oil refinery, cement factories and banking enterprises.) A quick look at the names of investors and companies cited by the Iraqi sources reveals the extent of business interests joining a section of the Lebanese elite and post-2003 Iraqi leaders. In the days of Saddam, it was alleged that many Lebanese politicians (and their relatives) acted as business intermediaries for the Iraqi dictator – amassing large fortunes in the process. Political figures involved in these deals allegedly included MPs, Ministers and even the son of an ex-President. With a new regime for a “New Iraq,” new (?) patterns of political/commercial partnerships seem to be emerging between the two countries." Let me make another prediction. Obama will be taken by Israeli occupation commanders on a helicopter tour of West Bank and Golan heights. Upon descending from the helicopter, he will make a statement to the effect that he did not know how small the terrain is, and how narrow Israel is. He will say a few words more about Israeli security needs. All U.S. senators, congress people, and presidential candidates go through this rituals. But they don't realize that when they make these statements they are saying basically this: I am not very bright, and I am really ignorant of geography. I never bothered to look at the map, and I am willing to utter whatever words dictated to me by my AIPAC-approved advisers. Oh, and I also am very insincere, and may criticize Israel after I celebrate my 80th birthday, like Jimmy Carter. White Supremacists for Israel: "Betancourt also spoke out for other prisoners held throughout the world, including Nobel Peace Prize laureate Aung San Suu Kyi, who is under house arrest in her native Myanmar, and Gilad Shalit, an Israeli soldier who was captured by Hamas-allied militants in 2006." So this new expert on foreign policy thinks that an Israeli occupation soldier is a prisoner, but the more than 10,000 Palestinian prisoners (including women, children, and elderly) are not? It says something about her race/ethnic standards, no? I reviewed this book by Ajami when I was still a graduate student. Notice that Zionist fanatics still regularly quote that review. But I don't understand: I have written more negative things about him since. And notice the language used: so even words are equated with "physical assault." I mean, I know that Zionist fanatics are very protective of one of their own, but don't they need to update their propaganda files? "In a review of his book The Vanished Imam, Asad Abu Khalil verbally assaulted Ajami, calling him a "neo-orientalist," an insult in Middle East studies circles."